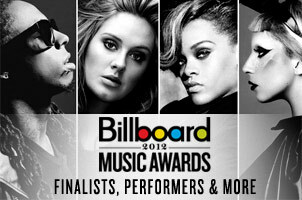 Adele, LMFAO, Rihanna, Lady Gaga and Lil Wayne lead the finalists for the 2012 Billboard Music Awards, which will take place at Las Vegas’ MGM Grand and be broadcast live Sunday May 20th, 8/7c on ABC. The awards will reflect Billboard’s chart rankings based on key fan interactions with music, including album sales and downloads, track downloads, radio airplay and touring as well as streaming and social interactions on Facebook, Twitter, Vevo, Youtube, Spotify and other popular online destinations for music. These measurements are tracked year-round by Billboard and its data partners, including Nielsen Entertainment and Next Big Sound. The awards will be based on the reporting period of March 1st, 2011 through February 29th, 2012. Top artists will be recognized in a variety of genres, including R&B, Rap, Pop, Country, Rock, Latin and Alternative.